A retirement service was held in honour of Pastor Oswald and Mrs. Georgina Cheremeh on Sunday, July 29, 2018, at Maamobi Central Assembly to draw the curtain down on their 21-year ministerial service. The event was officiated by the Chairman of The Church of Pentecost, Apostle Professor Opoku Onyinah, with assistance from the La Area Head, Apostle John Appiah Aidoo. Delivering a sermon titled “The Glorification Of Jesus Christ” with John 12:1-11 and John 13:27, Apostle Professor Opoku Onyinah explained that throughout the ministry of Jesus Christ on earth, He did not seek to glorify Himself in the discharge of His earthly duties until about a week to His crucifixion. He further mentioned three separate instances in the Bible where Jesus for the first time accepted the glory bestowed on Him. The first he mentioned was when Mary poured her expensive perfume on the feet of Jesus and wiped His feet with her hair (John 12). He explained that although Judas opposed it, Jesus supported what she had done and accepted the honour she had done Him. The second and third instances he mentioned were when a dinner was held in His honour (John 12:2) as well as the cheers and merrymaking that accompanied His triumphant entry into Jerusalem (Matthew 21). He explained that all these incidents preceded Christ’s crucifixion on the cross for all humankind. According to the Chairman, when Jesus stated in John 12:32 that He will draw all people to Himself when He is lifted up from the earth, He actually meant that after He has risen from the dead, He will be glorified and thus bring salvation to humankind. Concluding his sermon, Apostle Professor Opoku Onyinah said that every faithful and diligent servant of God is likely to face obstacles, attacks and challenges in life and ministry. However, God is faithful and will eventually see them through their challenges and glorify them just as Jesus Christ was glorified. 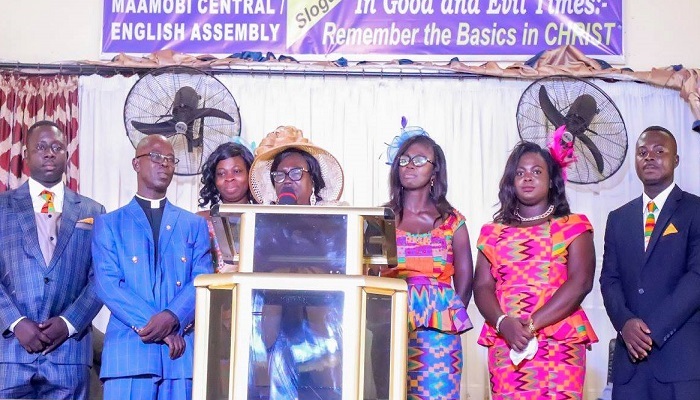 Pastor Oswald Cheremeh was called into the full-time ministry of The Church of Pentecost in January 1997 at Wa upon the recommendation of Apostle Joseph A. Mensah (retired). In the course of the ministry, Pastor Oswald Cheremeh served at Techiman Nsuta (1997-2003), Sankore (2003-2008), Asamankese (2008-2013) and finally Kotobabi, where he retired from active ministry. He served meritoriously in various leadership positions including Area Children’s Movement Assistant Leader, Area PEMEF Leader, Area Youth Leader, Area Children’s Ministry Leader, Area Audit Committee Chairman, Area Lay Leadership Training Coordinator and Area Pension Committee Member. Pastor Oswald Cheremeh, is his response, charged Christians to strive above all things to have their names written in the Book of Life since that is the ultimate goal of every believer. He was also grateful to his wife, Mrs. Georgina Cheremeh, their children and relatives for their support throughout his ministry. Present at the service were: Apostle Isaac Nii Kotei Djani (Executive Council Member and Tamale Area Head), Apostle Vincent Anane Denteh (Sefwi Bekwai Area Head), Apostle William Boakye Agyarko (Afram Plains Area Head), Apostle (Maj) Benjamin G. Kumi-Woode (Burma Camp Worship Centre), Apostle (Chief Supt) James T. Tetteh (Chaplain-General, Ghana Prisons Service), Apostle Isaac Tetteh Juddah (Oyarifa District), Apostle Emmanuel Kwesi Acquah (PIWC-Kokomlemle), Evangelist Samuel Agyei Asiamah (Maamobi District), Pastor Ohene Asa-Otu (Deputy Evangelism Director) and Apostle J. A. Mensah (Retired). Also in attendance were the La Area pastorate and their wives, Mrs. Grace Onyinah (Wife of the Chairman), Mrs. Rose Kumi-Larbi (Wife of the General Secretary), Mrs. Rebecca Assabil (Wife of Apostle J. K. Assabil), Mrs. Juliana Appiah Aidoo (Wife of La Area Head), Deaconess Grace Lucy Yeboah-Asuama (Women’s Director), Deaconess Margaret Osei (Deputy Women’s Director), Mrs. Irene Walker (Wife of the PUC Rector), Mrs. Grace Antwi (Wife of Kasoa Area Head), Mrs. Margaret Agyemang-Baduh (Wife of Apostle Johnson Agyemang-Baduh), Mrs. Juliana Boakye Agyarko (Wife of Afram Plains Area Head), Mrs. Comfort Ohemeng Kwakye (Wife of Sawla Area Head), La Area Women’s Ministry Executive and Nana Akua Ameyaa (Queenmother of Techiman), some active and retired ministers of the Church, the La Area Executive Committee Members, and La Area Deacon.